Bombing Bastards is a Bomberman clone developed by the Spot The Differences developer Sanuk Games and despite its foul title name is an enjoyable attempt at recreating the Bomberman formula now that the now defunct franchise has left a void in the party game genre. The solo campaign has over 30 levels over 5 different worlds and features superb boss battles and though it does a good job at feeling like a new Bomberman title the solo campaign isn't as enjoyable as the ones from the true Bomberman titles. 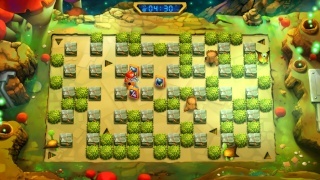 The multiplayer on the other hand is extremely enjoyable and has many different stages and options just like Bomberman possessed and it does an impressive job at mimicing Bomberman's level of uniqueness and quality of gameplay in this mode of play. It would be nice if there were an online multiplayer mode, but it's still good fun as it is! The controls in Bombing Bastards are smooth and easy to learn and it also has a nice selection of controller options to choose from including the Gamepad, Wii U Pro Controller, and the Wii Classic Controller Pro to name just a few, which is nice because some options such as the Wii U Pro Controller could be quite expensive to have a controller for each person, whereas Wii Classic Controller Pro's can be purchased through clearances and whatnot for just $5 - $10 each at this point! It's always nice to see developers try to give users more options to save them money so kudos goes to Sanuk Games! The Off-TV play is also fully functional and is enjoyable for those who don't always have access to a television set! 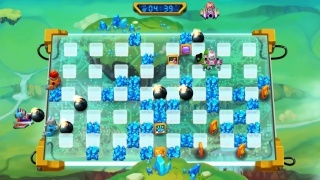 The only real negative we have for the game is that it really adds nothing to the Bomberman formula, which is a shame given the quality of the game it would have been nice if Sanuk Games had done something to make Bombing Bastards unique in some way, but even though the game might be a copycat, its quality is undeniable and the fact that they have essentially resurrected an iconic franchise and have come close to matching the level of quality that the original franchise possessed is a feat worthy of praise! The visual style of the game is very nice and has very polished character models and the special effects look superb as well. The boss designs are quite unique as are the backgrounds in each of the game's five worlds! The top-down camera angle is almost identical to that of the 2D Bomberman titles and it works well for the game's many stages! The soundtrack of the game is nice, but could use more variety and the voice-overs, while cool at first can become quite annoying after awhile so you might want to turn them off in the options! 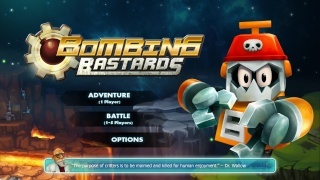 With great gameplay, excellent multiplayer, superb controls, and a solid audio-visual presentation Bombing Bastards is a great party game that will provide hours of fun! However the fact that the game doesn't try to do anything to make itself unique from the Bomberman franchise is fairly disappointing, but it's still a game that we recommend to any gamer looking for a superb multiplayer title for the Wii U! It's a shame that there isn't any online play though.